Although the okapi resembles a zebra, it is actually a close cousin to a giraffe. Discovered in 1900, it inhabits the rain forests of the Congo area in Africa. Okapis tend to be solitary animals, secretive in their habits. 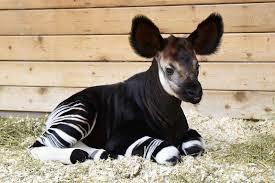 Example 1: Although the okapi looks like a zebra, it is really a close cousin to a giraffe. It was discovered in 1900 and it inhabits the rain forests of the Congo in Africa. Okapis are usually solitary animals and are secretive in their habits. Okapis eat mostly leaves, twigs and fruit which they reach with their long tongues. They may eat as much as 65 pounds of food in one day, mostly during the afternoon and evening when they are most active. Example 2: Okapis don't eat meat. They have a very long tongue that helps them reach their food from the trees around them. Okapis do most of their hunting for food in late in the day. They need to eat almost 65 pounds of food each day to survive.